A demonstration of pruning apple trees (photo credit: ILRI/Temesgen Alene). In its first phase (2012-2016), the Africa RISING program in the Ethiopian highlands tested and validated high value trees including five varieties of avocado (Percia america), apple (Malus x domestica Borkh), and five varieties of walnut in its research sites. These trees suitability for use was identified through on-farm, experimental and laboratory trials and socio-economic and capacity building surveys. A couple of awareness raising activities were also carried out through field visits on pre- and post-planting tree management. 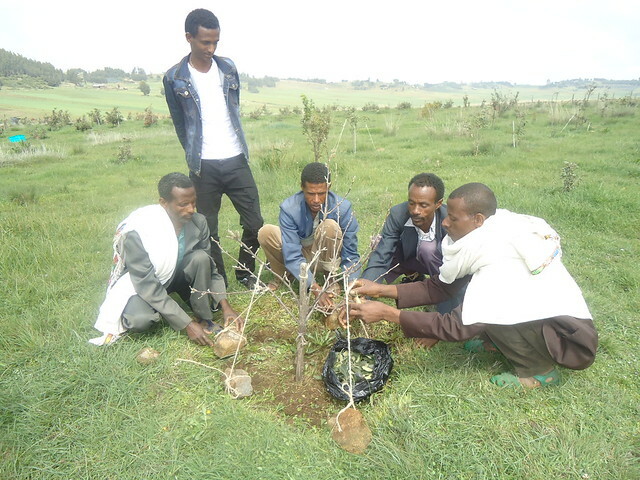 Fifty farmers participated in the highland fruits (apple) research protocols from two kebeles (Gosh Bado and Gudo Beret) of Basona Worena woreda. Assessment done during field days shows that these farmers’ experiences showed that many of them faced difficulties in managing the high value trees. The findings also showed that scaling-up of high value tress farming requires capacity building and addressing of skills gaps of farmers, development agents and nursery workers in these areas. 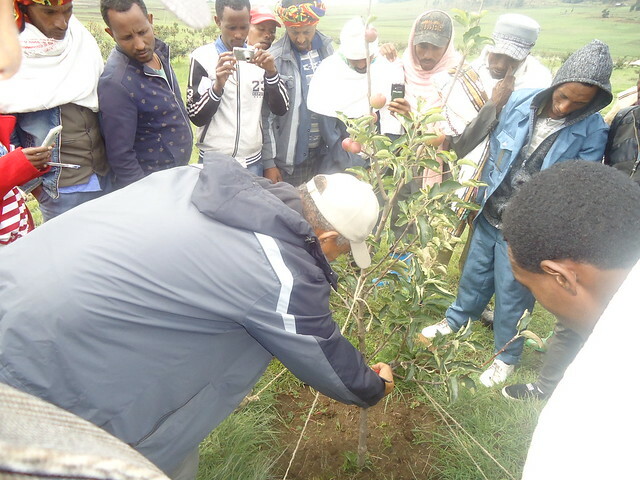 Africa RISING in collaboration with the private Faji Apple farm in Debre Birhan organized a series of training sessions on apple production and management for scaling-up partners in three woredas (Basona Worena, Angolelana Tera and Tarmaber) of North Shewa Zone in the Amhara region in July 2017. The objective was to equip farmers, development agents (DAs) and experts with theoretical and practical information on apple farming management to speed-up the scaling up of apple production in the zone. Practical training on pit preparation for participants from Basona Worena woreda (photo credit: ILRI/Temesgen Alene). A total of 44 farmers (3 female), 13 kebele development agents (3 female), 5 Woreda experts (2 female), and 3 zone experts (1 female) participated in the three-day (rounds of) training. They said the sessions gave them relevant and deeper understanding on apple production and management. Yeshidagena Gideba a model farmer from Bakello Kebele, said the training equipped her with information on how apples are farmed and it also gave her to taste apple for the first time in her life. Mekuriya Mengistie from Gudo Beret kebele said the training changed his attitude about the importance of apple trees, which he now sees are of high value. Most of the DAs who took part in the training promised to take the training to the lower level and to more farmers. Representatives of the North Shewa Zone Office of Agriculture, Askale Yifru, Afework Taddese and Hulumeyifer Taddess, said the training would address existing gaps in apple farming among farmers. Training on leaf defoliation for Tarmaber woreda trainees (photo credit: ILRI/Temesgen Alene). During the closing of the three days training Belachew Nigussie, deputy head of the North Shewa Zone Office of Agriculture recognized Africa RISING’s role in responding to the gaps identified during the first phase of the project implementation phase. He called on the trainees, particularly the farmers, to apply lessons from the training and to serve as models for other farmers. He pledged his team’s support in the scaling -up of apple production in the zone. 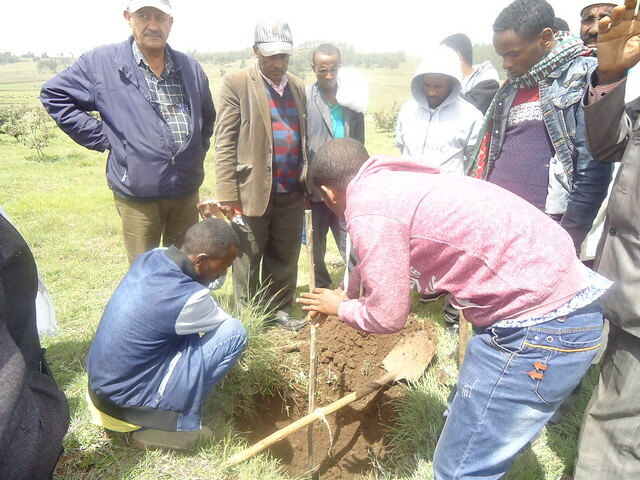 Kindu Mekonnen, crop livestock systems scientist, said that in the long-term, the effort is expected to reach 2,000 who will plant 39,000 apple tree seedlings. Tags: apples, sustainable intensification, training. Bookmark the permalink.